An old friend from high school who got in touch with me through the comments (Hi JP) pointed out the Tour de France is coming up. I always manage to forget this for some reason even though it's the only sports event I ever watch. Actually maybe I forget it because it's the only sports event I watch. Here's some pre-race information on who is racing this year. I'm sure everyone is aware that Lance isn't racing. Doping Investigation. First off, there is a huge question mark on the race right now. There is a Spanish investigation into doping that is going on right now. Ullrich (T-Mobile) was almost banned from racing this year because of it. He has been implicated tangentially but Ullrich says the inferences are not true. Ullrich hasn't been named by the investigation but a Spanish newspaper suggests he is one of the targets. His status is still a little in flux as a result but for now he is in. Organizers have also asked Team Astana-Wurth to withdraw (they were formerly known as Liberty Seguros) because the Spanish investigation led to the arrest of the former team director of Liberty Seguros. Liberty withdrew and then Astana-Wurth took over the team (hence the rename) and fired the director. But the investigations show at least 15 members of the team may have received prohibited substances. Alexandre Vinokourov is on this team. It's unclear if he could be picked up by another team on such short notice if the team is disbanded. The team wants a sports arbitration court to rule on this. But no one knows for sure who is involved. The investigation has not publically released the information about who is involved and probably won't until the race starts. Crazy! Then today the UCI president Pat McQuaid stated he wants written statements from each rider stating that they are not involved with this investigation. Who knows what hornet's nest that will stir up. But the implications are potentially impactful to the race. A team could do some investigation and figure out who might be involved and boot them off the team. But doing so this late in the game (the race starts this coming weekend) would have a jarring effect on the team. But if they don't do this and the investigation information is released during the Tour then the implicated riders could be booted at that point. Can you imagine? It can be found here. Here's a better one where you can see which stages have mountain climbs. If you use Google Earth the entire race has been mapped here. Basically Stage 11 (7/13), Stage 15 (7/18; L'Alpe d'Huez!! ), and Stage 16 (7/19) look to be the big mountain stages. Mark your calendars. 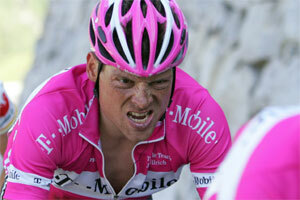 Jan Ullrich (T-Mobile). He's back. And no longer does he have to worry about Lance. Kloden's also back on the team. He could rightly be a lead on any team and may cause the same type of "who's the leader here?" problems that Ullrich has had these last few years. I don't recognize a lot of the other riders on the team except Sevilla who is talented. But I hear the team is good. Most people forget Ullrich did win the Tour once. When he was much younger in '97. He's 32 now. That's pushing it but not too much. It's actually a better age than 23 in terms of winning the Tour. His biggest problem? He started training late again. His knees have been bum for most of the season. So what's new? 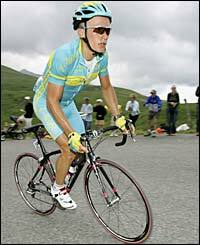 Alexandre Vinokourov (Astana Wurth). This guy perplexes me. He seems like someone who could be on the podium (top 3). But I always have this nagging feeling he's going to crack. He seems to race stubbornly, meaning he over exerts himself when he should just lay low. It's a winning spirit in one sense but it can lead to utter and complete disaster if it happens at the wrong time. It's also an aspect that the competition can try to take advantage of (Lance did frequently). He's like Maverick from Top Gun. He just doesn't understand strategy and mind games. Plus he's distracted by the investigation around his team. 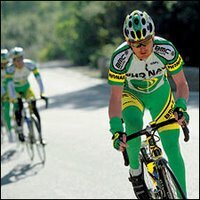 Floyd Landis (Phonak). One of the few U.S. contenders. I don't think he has the fortitude to dig down deep and come up with a win. I think he's still a little too green. He still needs to undergo some mind crushing defeat and climb back from it to have the constitution to win the Tour. He's has won some stages this year so he's not a pushover. He'll make some stages interesting I'm sure. His team is somewhat weak as well. Botero and Gutierrez are not on the team this year (it's related to the drug investigation) and they helped out immensely last year. He's got mountain and time trial capabilities but he's not the best in either one. And quite frankly he's probably too nice of a guy. I feel this sport requires a certain amount of assholeness to win. Alejandro Valverde (Caisse d'Espargne). Remember this guy? Remember the picture? Go read here if you've forgotten. He's the guy who edged out Lance on one of the first big climbs at Courchevel. He eventually burned himself out a few stages later. Probably this win took it out of him. Like Basso an outstanding climber who showed his stuff last year. He's a big unknown. I'm not sure what to think about his chances. He could be the wild card. If he does well then maybe he's another 5 time winner in the making. I just want to see if this guy has the stuff this year. Levi Leipheimer (Gerolsteiner). A wild card worth mentioning. He's a consistent performer but just never seems good enough to get up on the podium. I really don't think he has a chance because I don't think he has the necessary amount of physical ability. He'll probably place top 10 and maybe top 5. 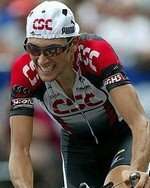 Ivan Basso (CSC). You have to pick this guy to win. He won the Tour of Italy (natch) this year by an enormous margin. But wins in the season's races don't necessarily mean anything. Lance didn't win any of these races when he won the Tour. In fact no one since Pantani has won both tours. At 28 he's at a good age. Not too young and not too old. And his placements have improved each year - 11th in '02, 7th in '03, 3rd in '04, 2nd '05. He's an excellent mountain climber. As good as Lance in his last year. And mountain climbers always win. His weakness is time trials. He's has improved but he's not going to beat Ullrich unless he's really off this year. He'll have to take time from him in the mountains. Plus I think keeping up with Lance these last few years has given him the confidence to beat anyone. What's funny is that is exactly what the odds makers have.